One of the most crucial decisions an eCommerce business has to make is whether to offer free shipping. If the retailer does opt to provide free shipping, then other equally important decisions have to be made, like what kind of go-to-market process will be implemented. An online retailer’s free shipping policy can boost conversions, but it can also add to expenses. Luckily, there are several strategies open to a company. One of the best ways to make good use of free shipping is to offer a flat rate for all packages, or flat rates for total orders and weight ranges. However, this method requires intensive planning and preparation. The company has to figure out the average cost of shipping. This is to ensure that they do not overcharge or undercharge clients. When they do come up with the right cost, the price will likely be a little over or under the actual shipping cost. But this discrepancy would even out eventually. Retailers considering a flat rate should be aware that they would need to conduct several tests to see which would work better – pricing by weight range or order totals. The majority of consumers would undoubtedly favor the second option. Studies have shown that the conversion numbers for the second offer were double that of the first offer. This method also works very well for unique products and items that are hard to find. So how does one incorporate the cost of shipping into the product’s price? One way is to change the price of items below the free shipping threshold so that it would include part of the expected shipping cost. For instance, you can add 13% of the expected shipping cost to items priced at $10. So from $10, the product will now cost $11.30. With this strategy, you get to offer free shipping while recouping part of the cost. 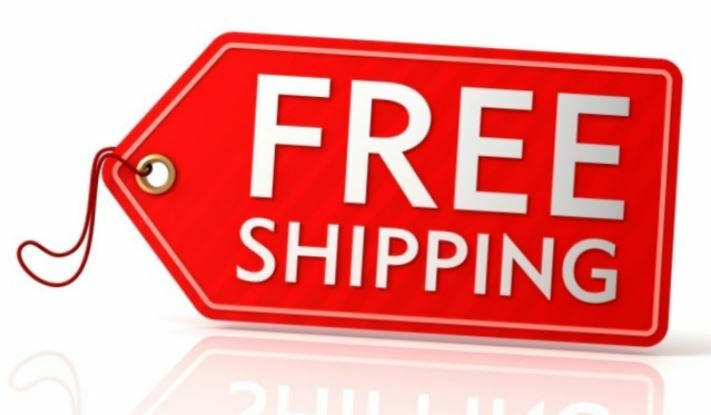 Thousands of online retailers have found that ground shipping is the most affordable option, so this is the most common type used in free shipping. But retailers should make it clear to customers that this is not overnight shipping and that an additional fee will be charged if they want to expedite the process. Ground shipping can actually reduce your shipping expenses by as much as 50% and most can easily meet 2-day expedited shipping requirements. If the product is to be delivered somewhere near the office or distribution center, then you can use the cheapest ground option available, meet the delivery window, and save money. Don’t be afraid that your clients will be put-off by the 2-day wait. Nearly all online buyers are willing to wait longer for a product as long as shipping is free. Another way to reduce the negative impact of free shipping is to exclude specific products from the service. Companies can exclude large and heavy items with high shipping cost and products with low margins from free shipping. They can also just offer the free service exclusively to high volume products with low shipping costs. Do not look at free shipping as a financial black hole. Savvy retailers can utilize free shipping as leverage to boost conversions and average orders while reducing any negative impact it might have on revenue. How Will the Repeal of Net Neutrality Affect Small Business?